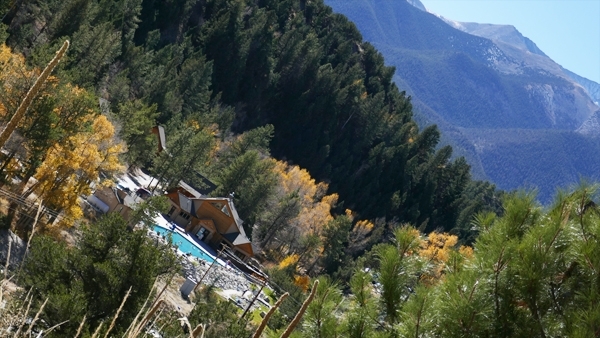 Mount Princeton Hot Springs Resort is located at the base of Mt. 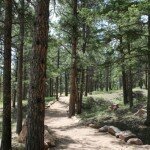 Princeton in the Rocky Mountains of Colorado. 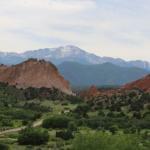 The picturesque setting creates a relaxing ambiance to get-a-away from city life. 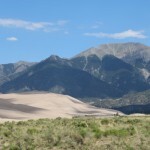 People come for both the scenery and the hot springs. 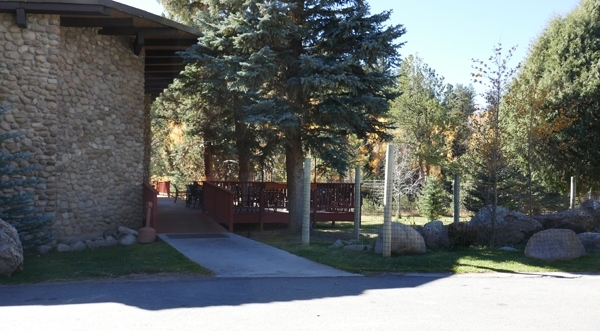 Parking: Designated accessible parking is available in the lot next to the lodge and one spot is located in front of the hot spring pools. 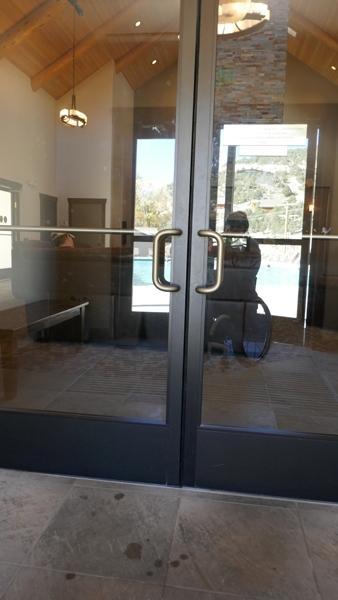 Doors: The main/front doors to the lodge and the hot springs are automatic, but others are not, including the exit door to the actual hot spring pools. 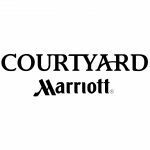 Check-in Desk: Not lowered for access, but the staff was able to accommodate guests in wheelchairs by using a clipboard for any signatures. Food and Drinks: The resort has a restaurant with a full bar. Snacks and drinks are also available in the lounge area of the hot springs. 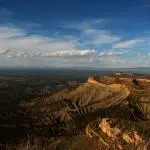 At each location, there are tables with chairs that can be removed to accommodate guests using wheelchairs, and both the restaurant and hot springs have outdoor seating options. 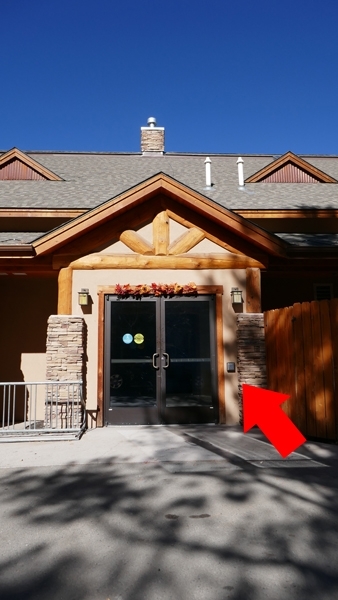 There’s a ramp to the main lodge patio outside. 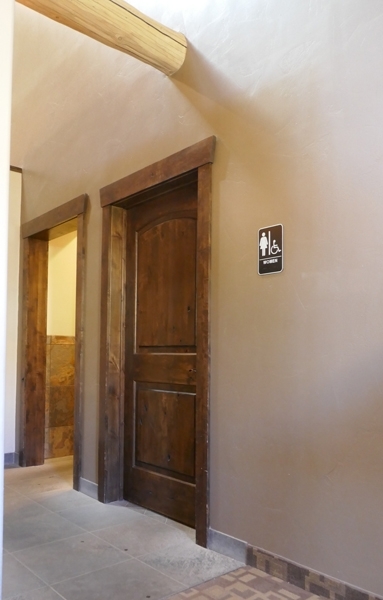 Bathrooms: Wheelchair accessible bathrooms are located in the lodge lobby as well as the lobby for the hot springs. 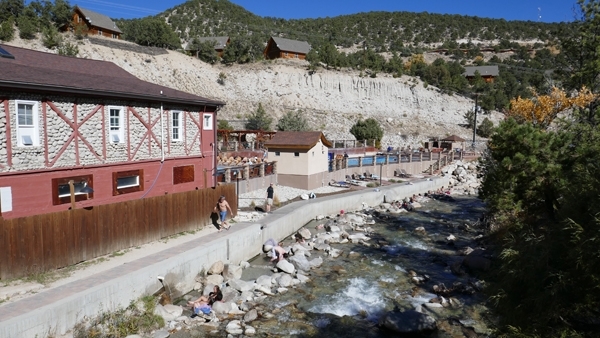 Hot Springs: There are several pools and a river that are available for guests to enjoy the hot springs. The only one with a lift for the guests to get guests in and out is in the main/general pool. 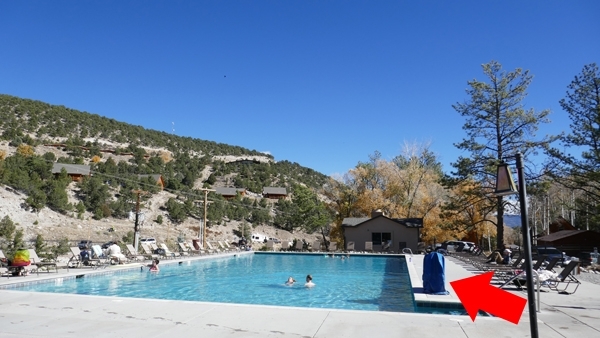 This pool is the least warm, and other pools are smaller and vary in temperature. 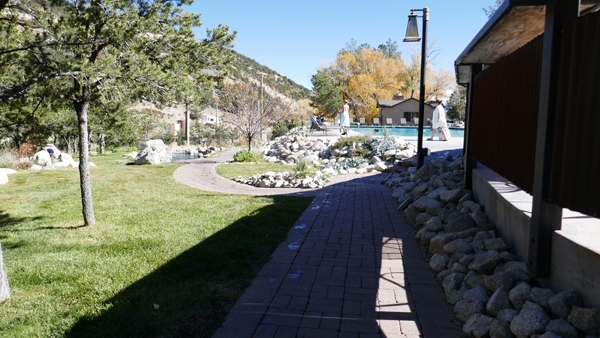 Getting around the majority of the hot spring area is barrier-free and around the main pool is a flat surface; cobblestone ramps lead to the pools. 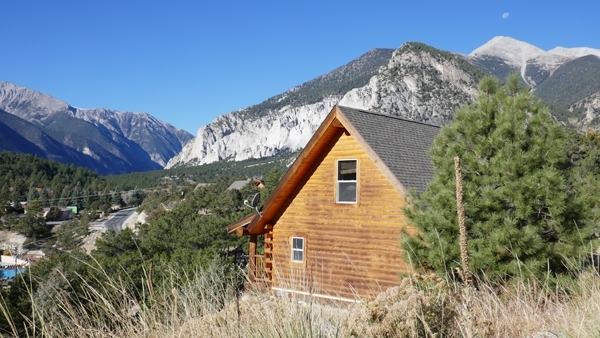 To get to the hot springs from the main lodge, the most accessible route is to drive over. 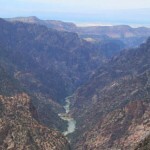 There is a steep, paved pathway that leads from the corner of the lodge parking lot and across the river to the hot spring pools, however, it is not barrier-free. 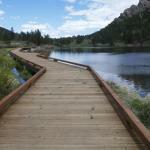 At the end of the steep ramp there is a single step followed by a dirt path and a bridge to the hot springs. Conference Buildings: There is a conference building right next to the main lodge and another one, more secluded, on top of the hill on the property. 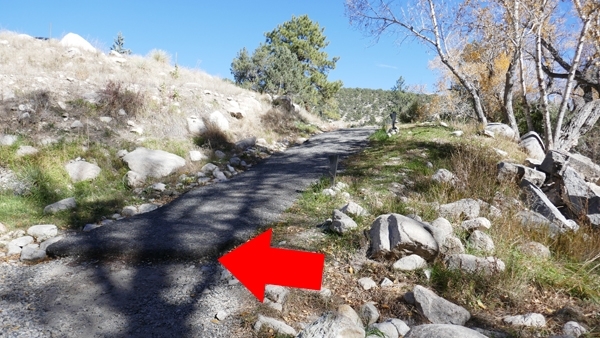 Both are barrier-free with modified wheelchair accessible bathrooms, but the one on top of the hill has dirt parking, which may be challenging for someone in a wheelchair if not dropped off. 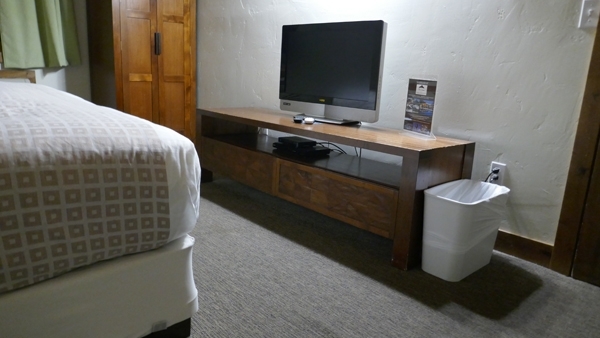 This room is the only ADA overnight accommodation on the property. 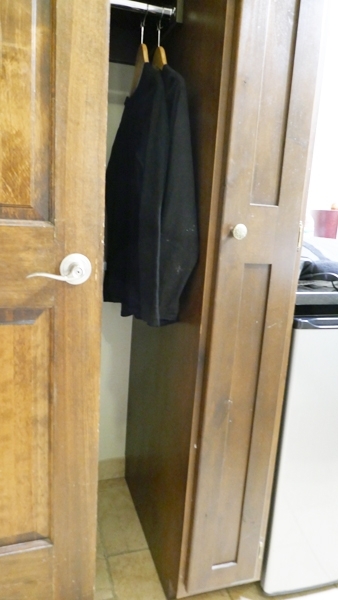 Closet: Has not been modified with a lowered clothing bar. Heating/Cooling System: Is located on the floor beside the window. Most will be able to access it. 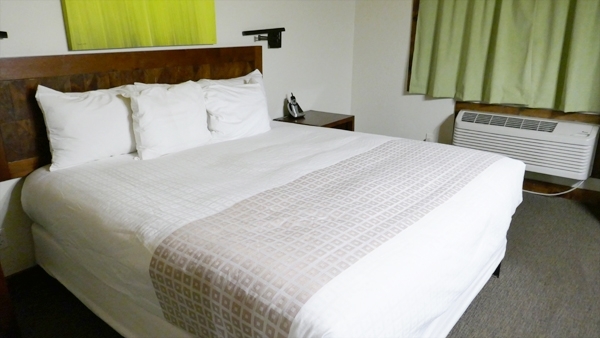 Bed: One king bed with open access on each side. 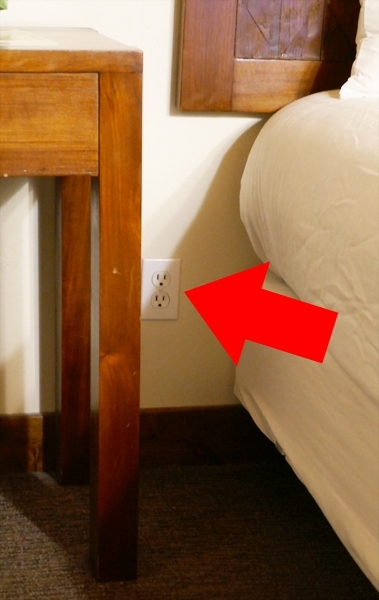 One of the sides has an open power outlet within reach of the bed. 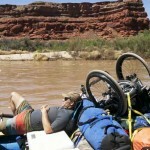 The bed is not too high to transfer from a manual wheelchair. 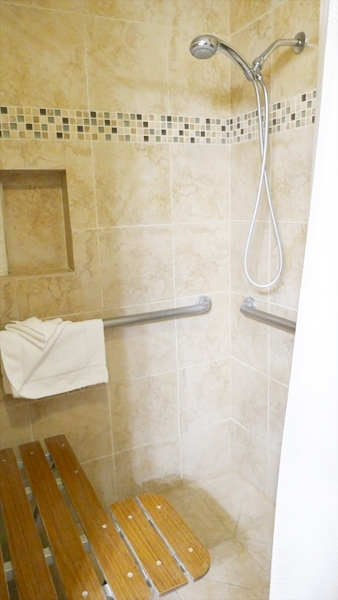 Shower: A roll-in shower is equipped with a mounted bench and hand-held shower nozzle. 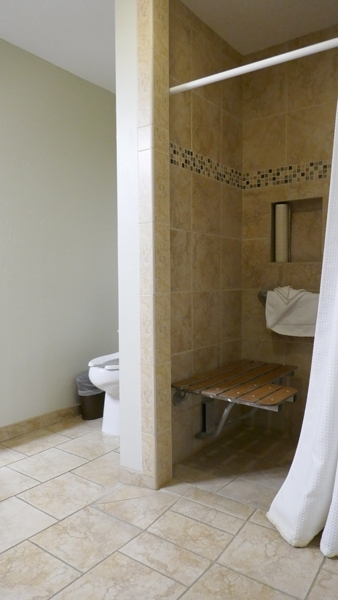 The shelf for shampoo and soap is located within reach of the bench. There is not, however, a holder for the nozzle, nor does it adjust in height. Sink: A roll-up sink with counter and storage space next to it. 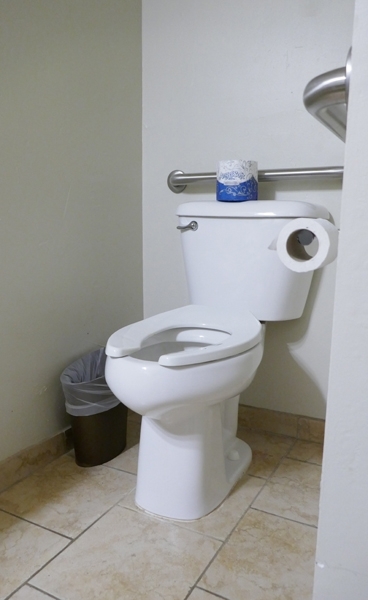 Toilet: Located in the corner of the bathroom. 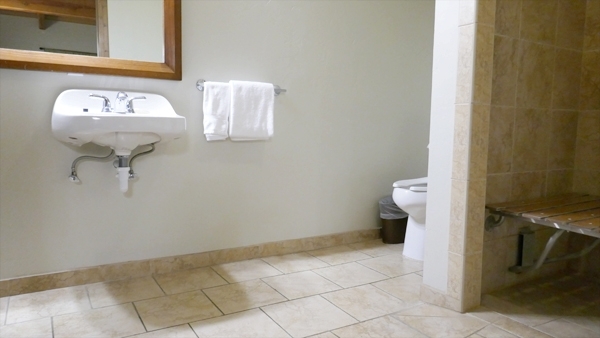 Transferring from a wheelchair to the toilet from the side is not possible, frontal transfers only. 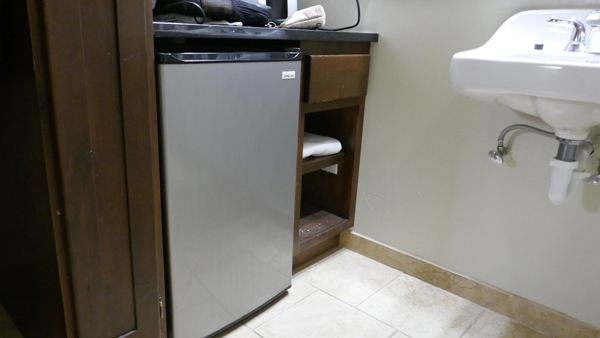 Bathroom MISC: The refrigerator is located in the bathroom along with cabinets with multiple shelves for personal items.